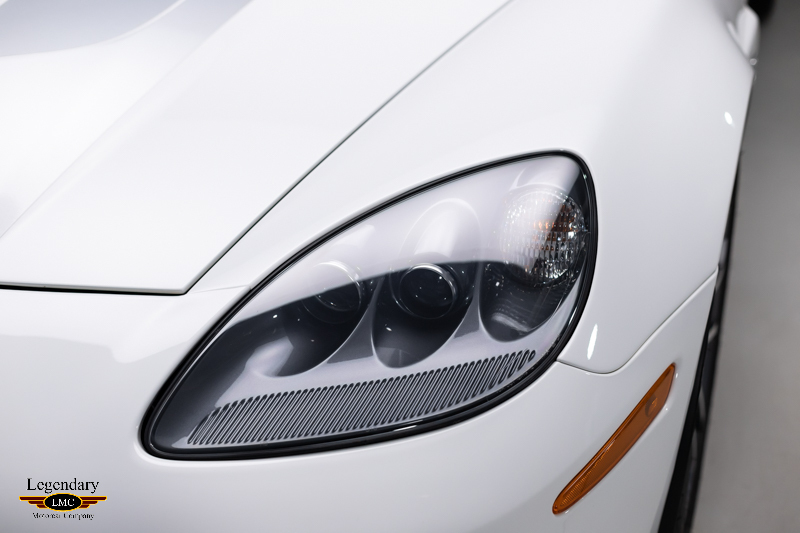 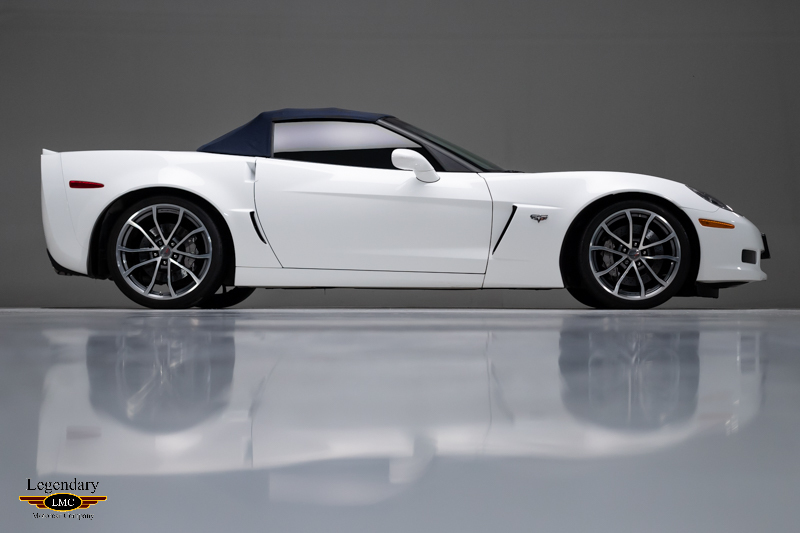 Click any thumbnail below to display the 2013 Chevrolet Corvette 60th Anniversary slide show. 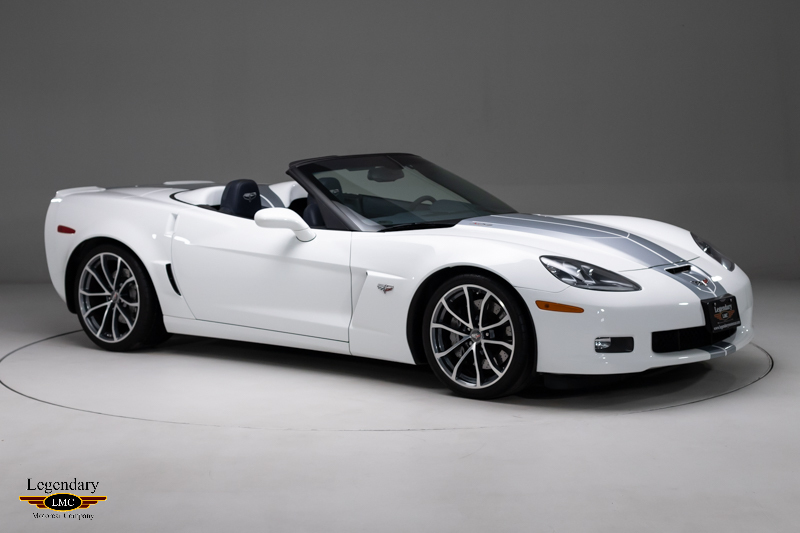 2013 marked an important milestone for Chevrolet, the Corvettes 60th anniversary of production, making it one of the longest running model lines in history. 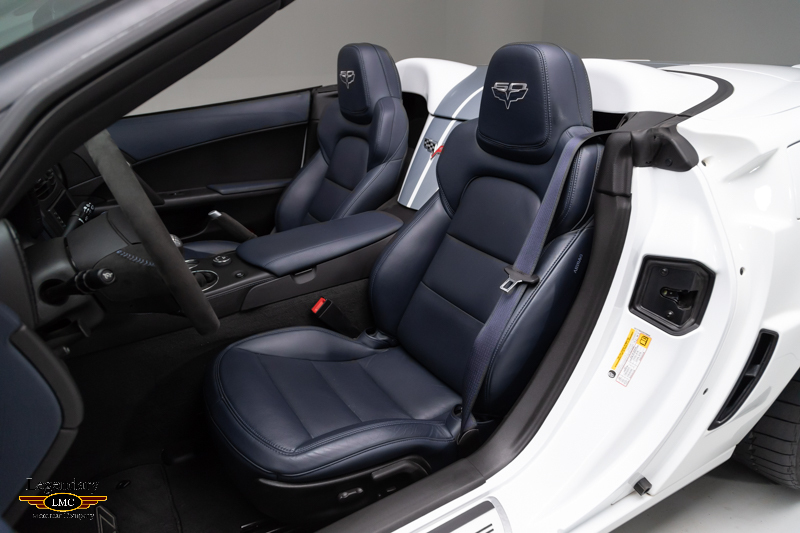 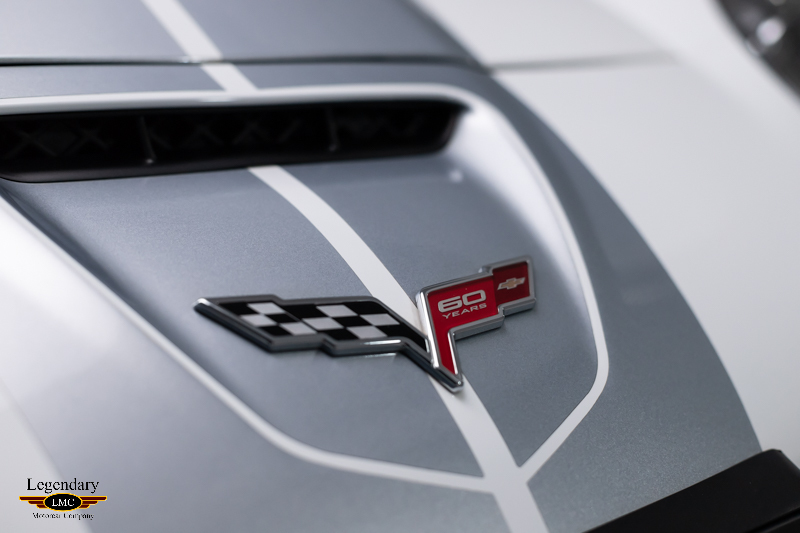 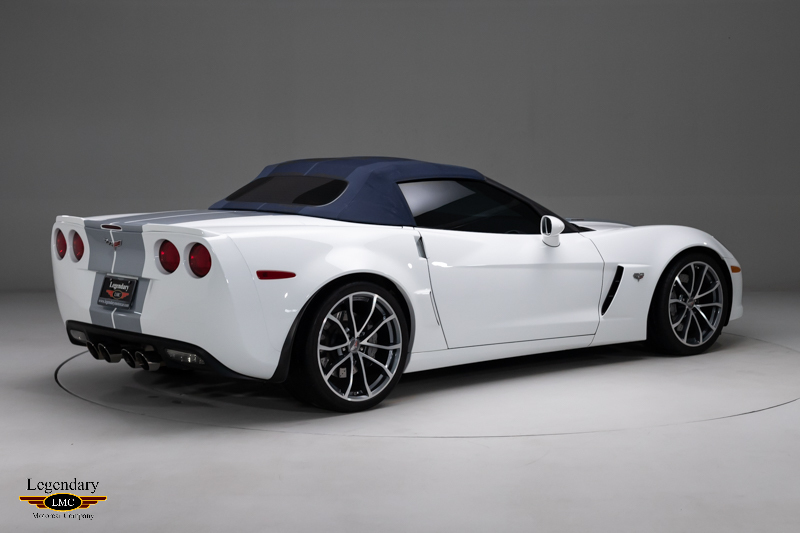 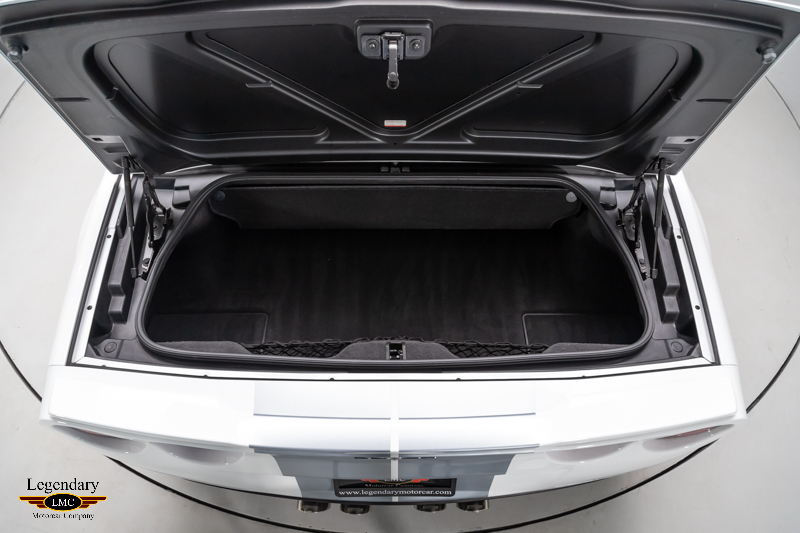 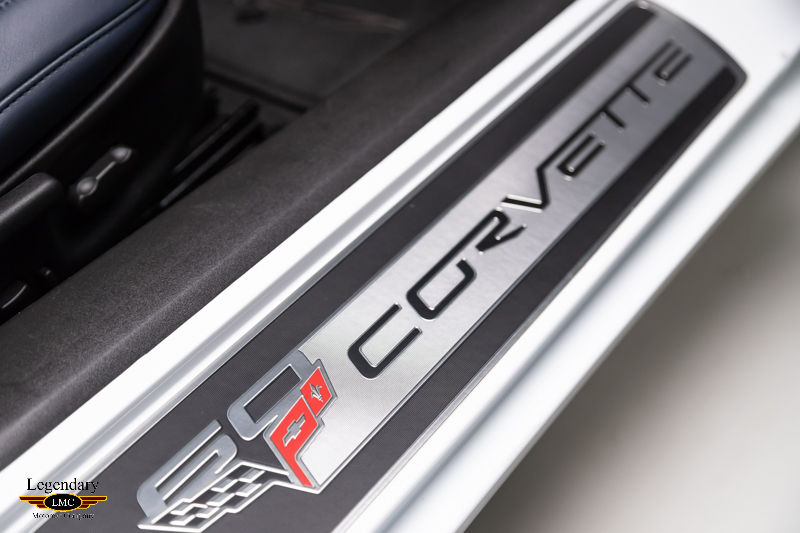 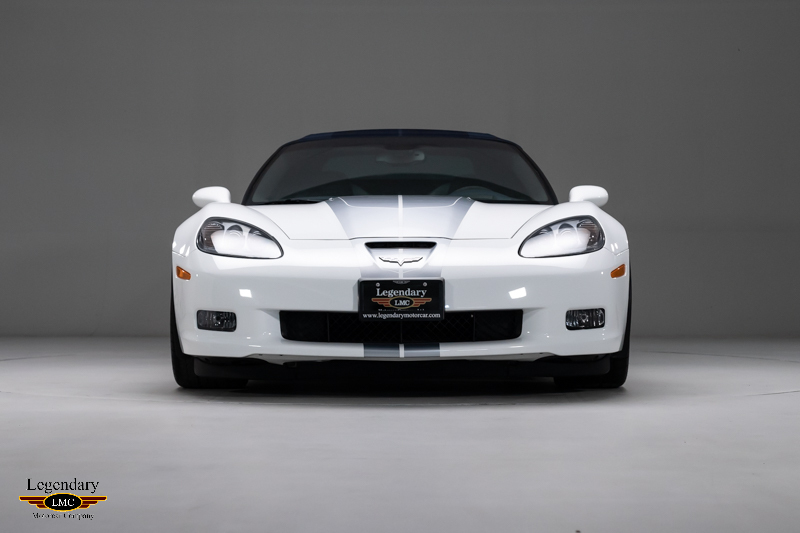 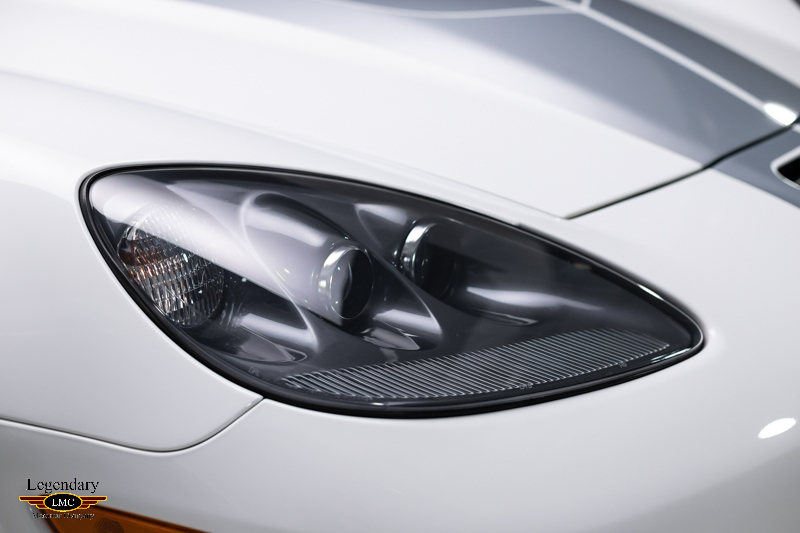 To commemorate this special occasion, they unveiled the 60th anniversary package giving the cars a unique appearance in Arctic White paint with Diamond Blue interior, as well as all the other options available on the Corvette line. 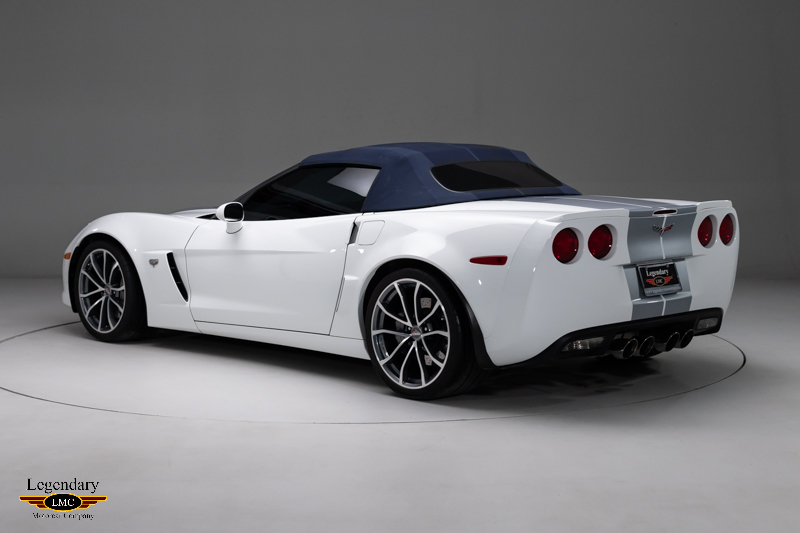 This stunning Corvette 427 is equipped with all the desirable options one would want on their Corvette. 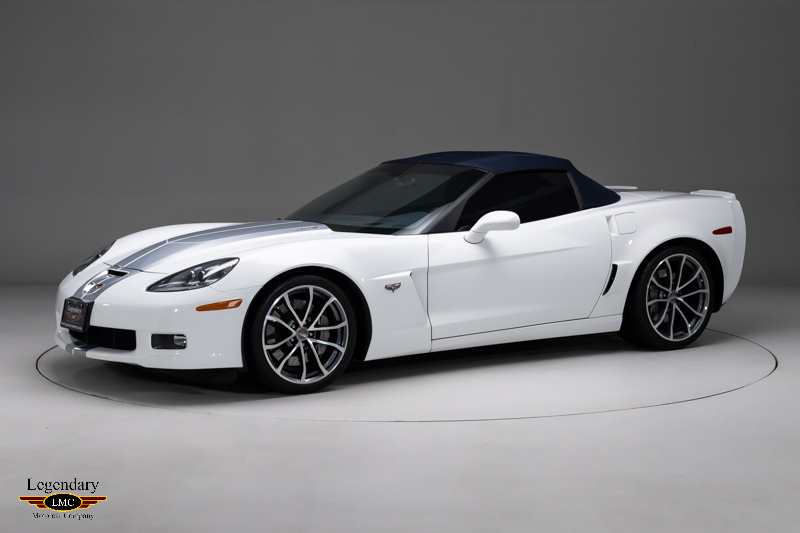 Most noticeable is of course the 60th Anniversary design package giving it the Arctic White exterior and blue interior. 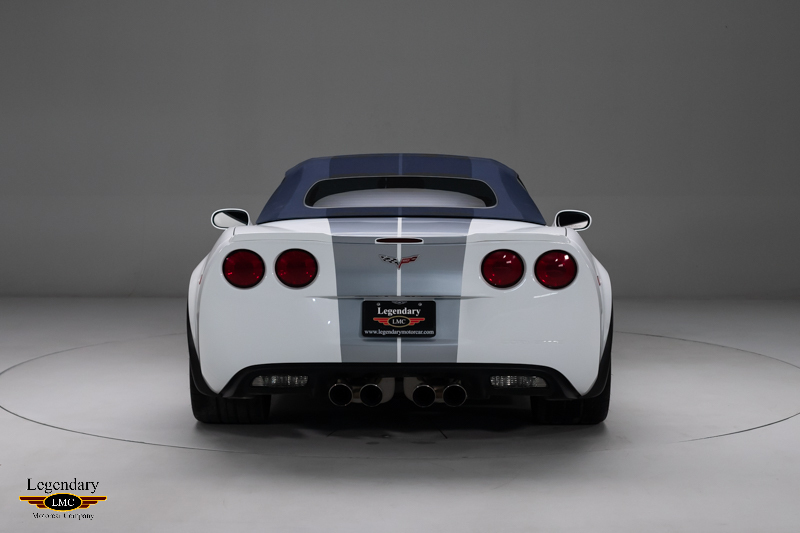 Accenting this beautiful Corvette is the optional 60th anniversary stripe package giving this car a very special look. 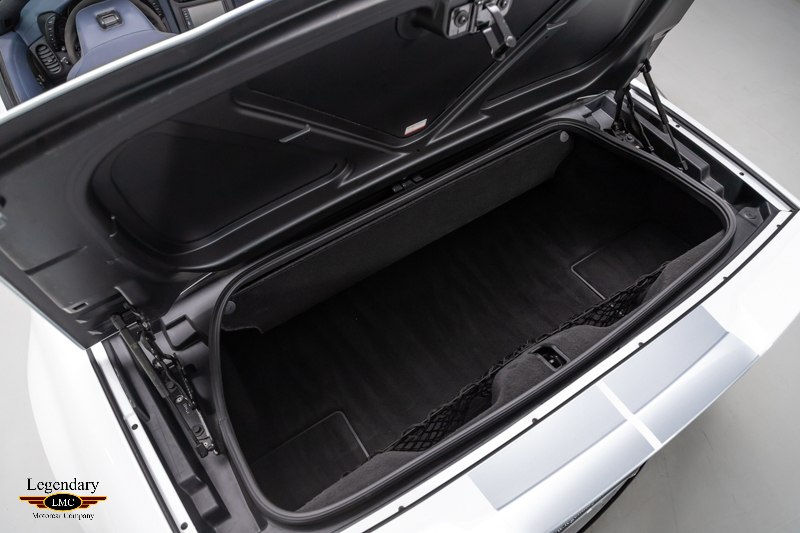 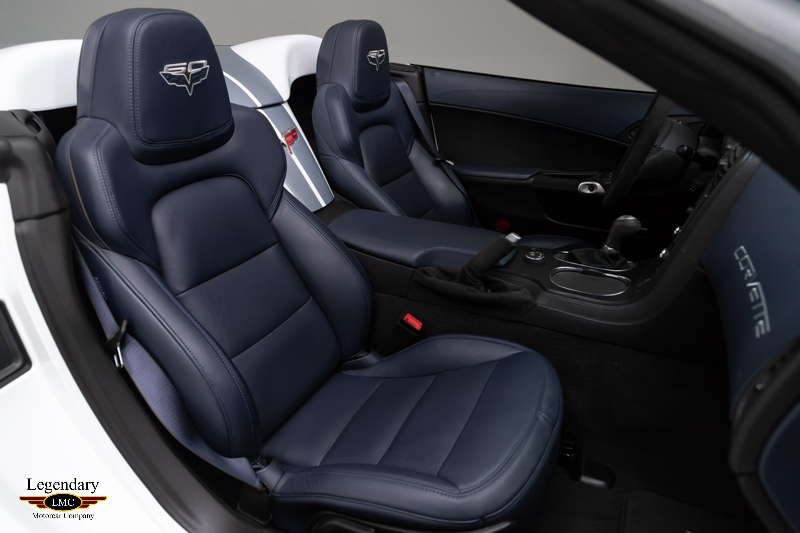 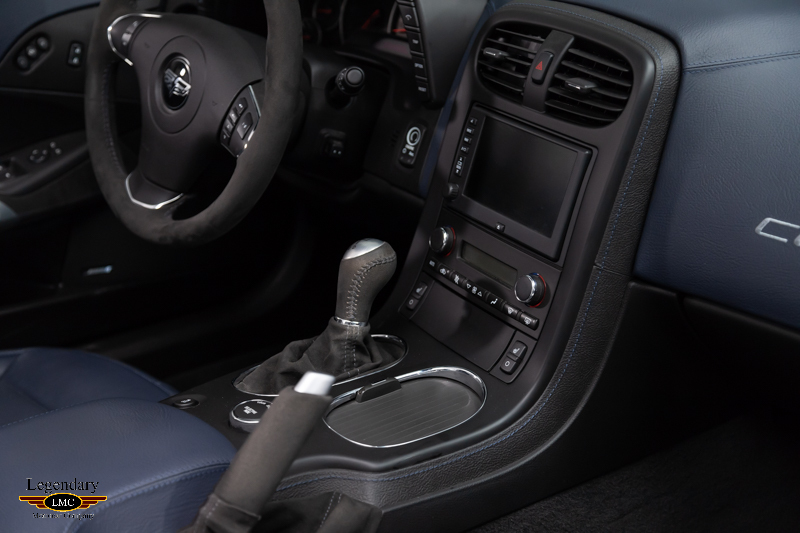 Open the door and the Diamond Blue interior catches your eye along with the special blue stitching seen throughout. 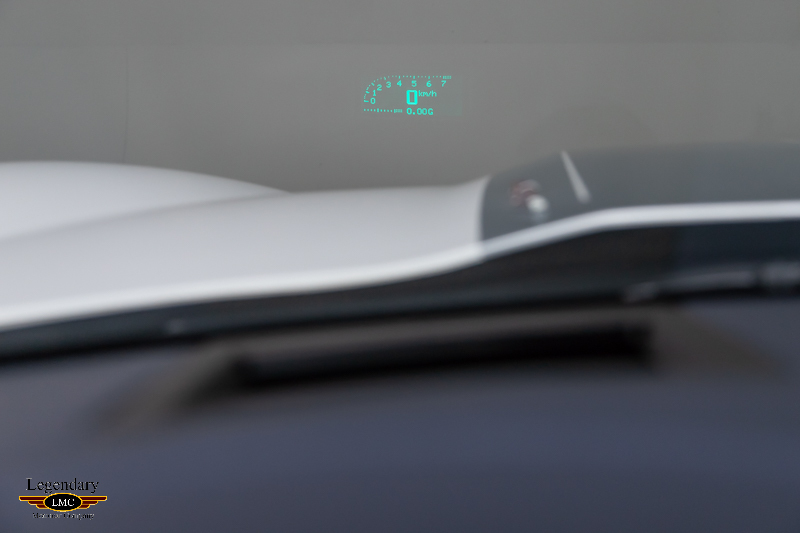 The dash is filled with the navigation screen which comes as part of the 3LZ package on this car. 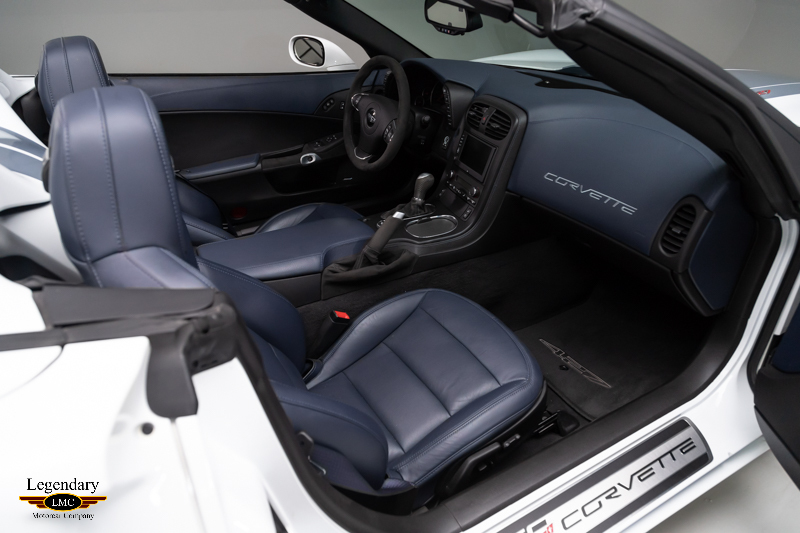 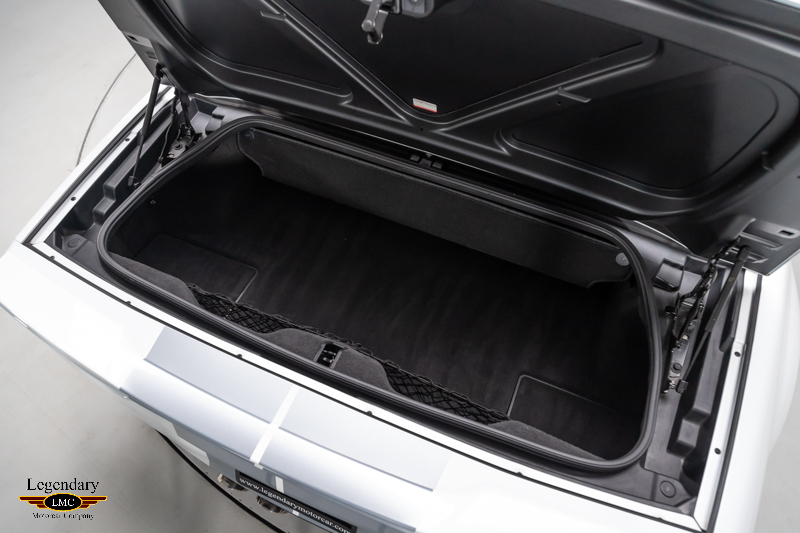 Also, part of this package is power heated seats, tilt/telescopic steering wheel, BOSE premium 9 speaker audio system, Bluetooth for your phone and much more. 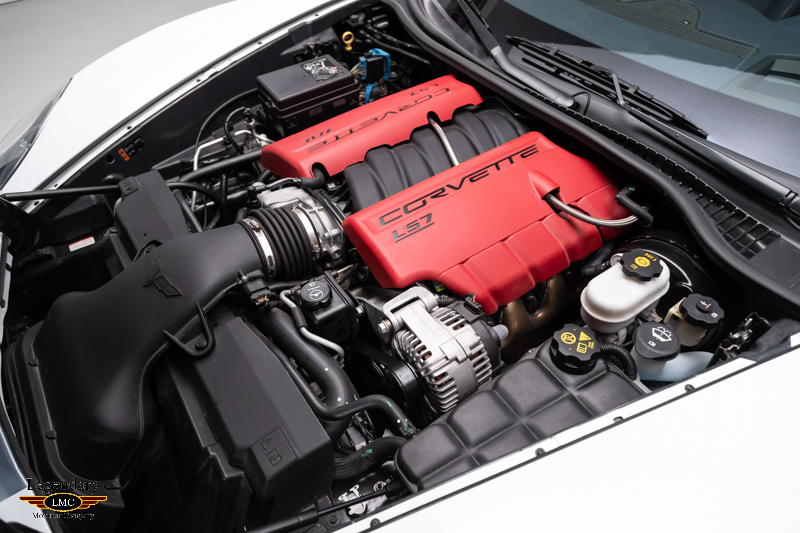 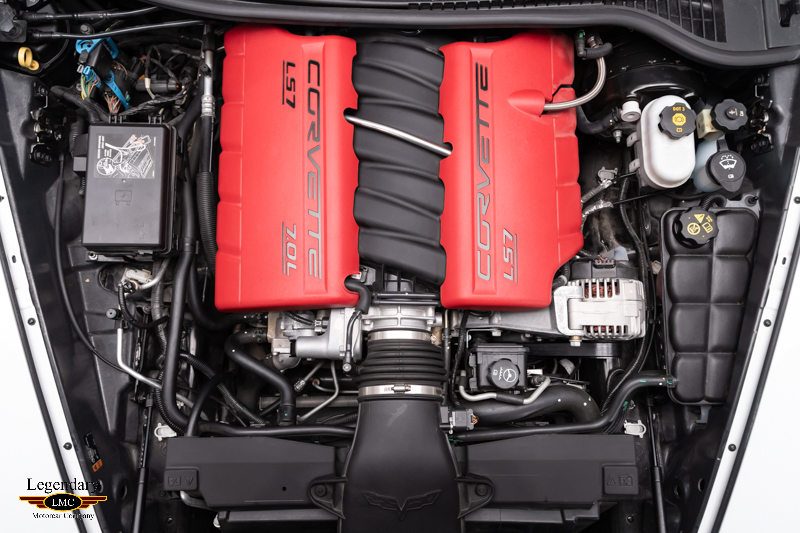 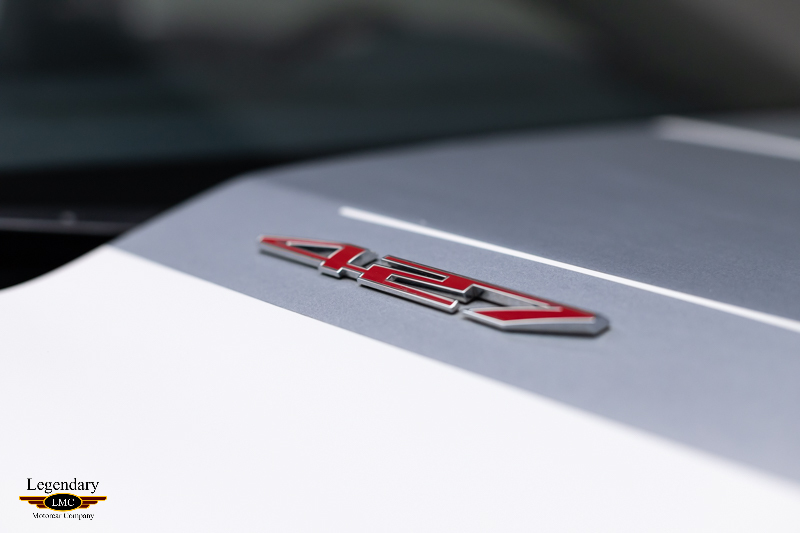 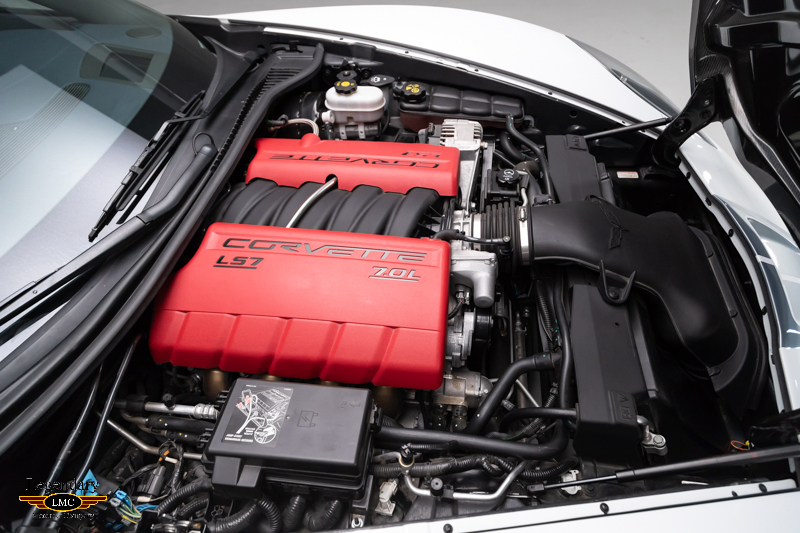 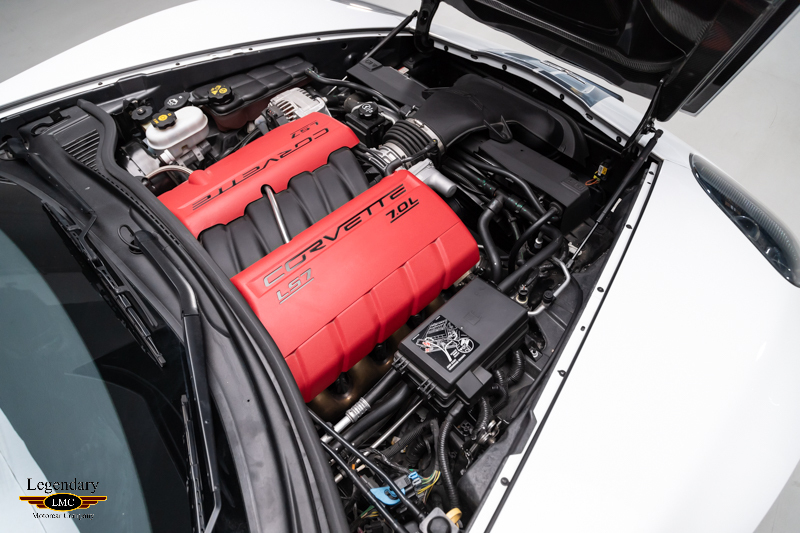 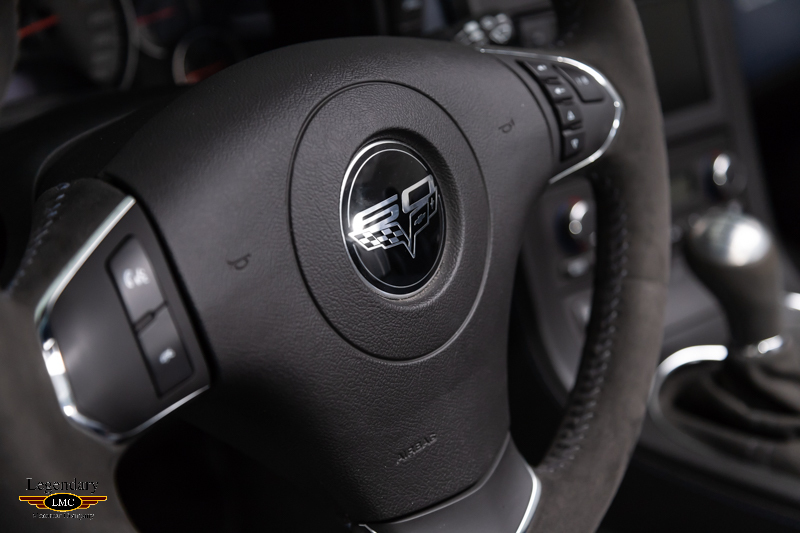 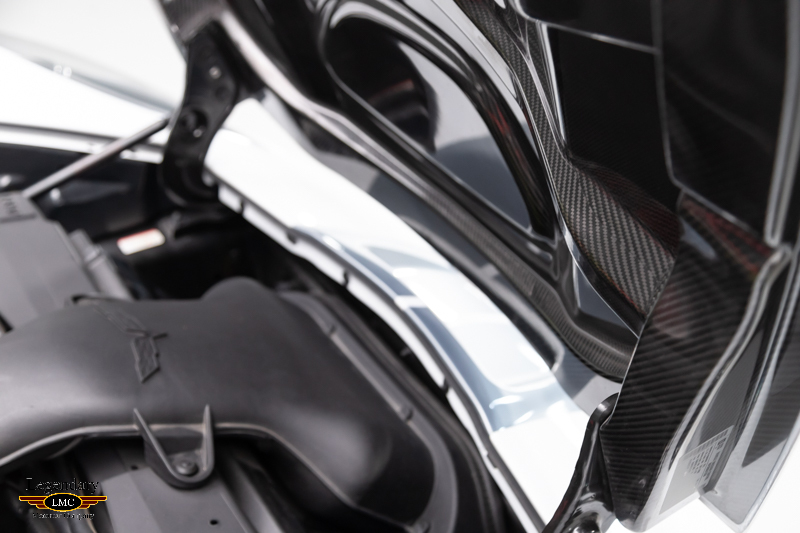 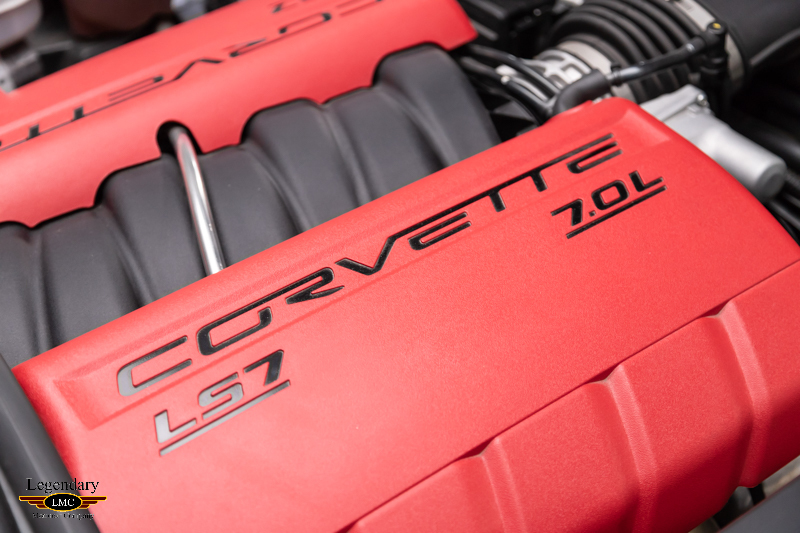 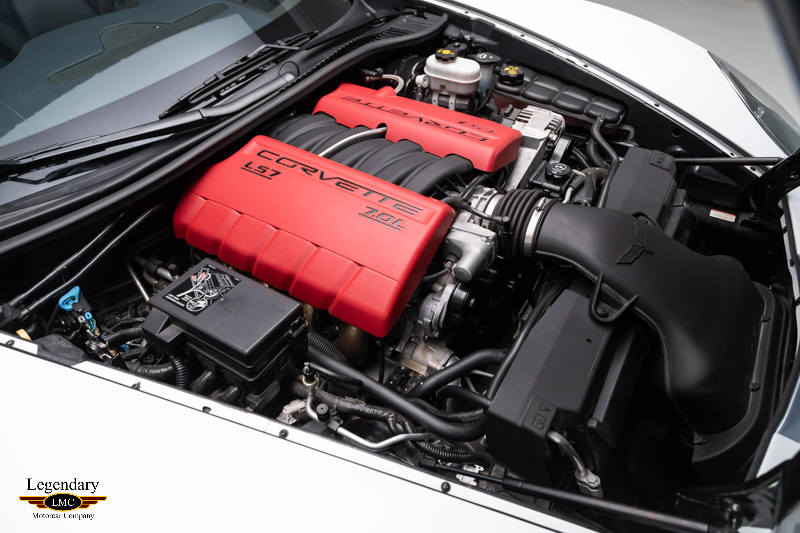 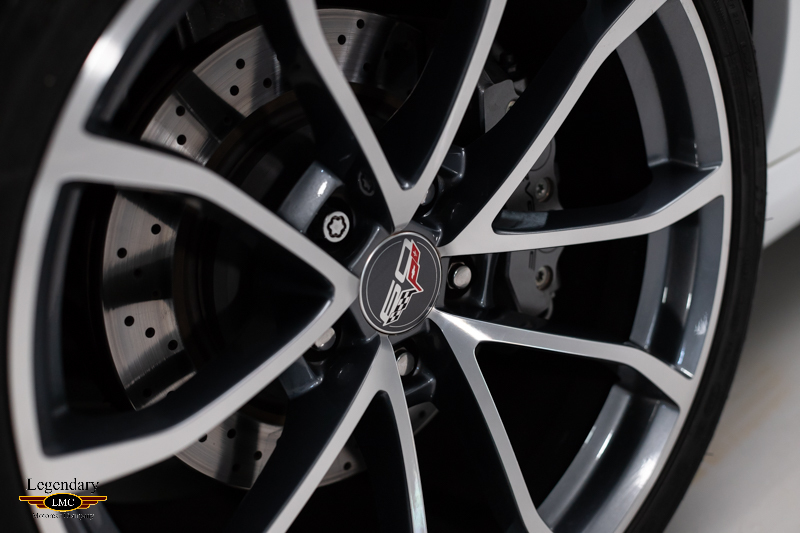 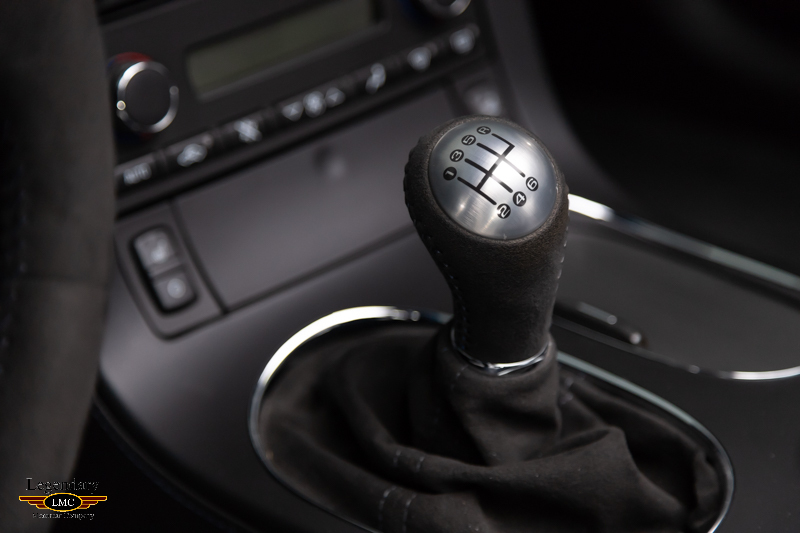 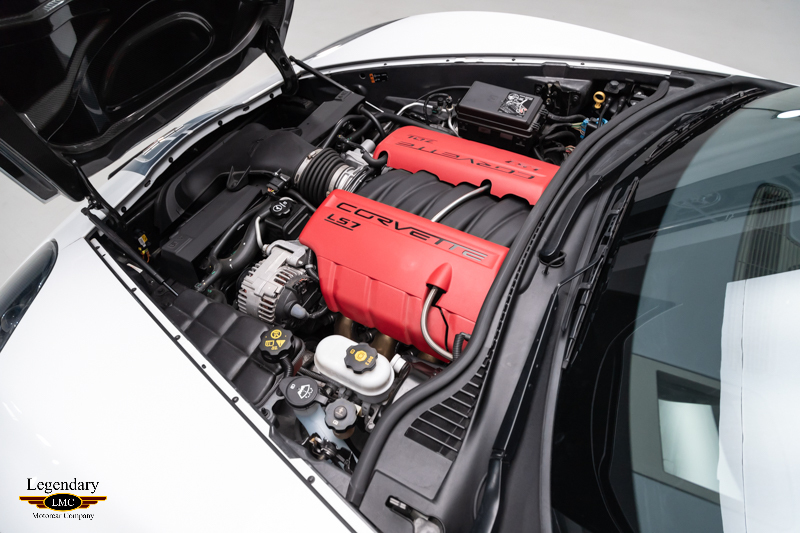 Of course, it comes with all the standard Z06 performance pieces including the centerpiece of the car, the 7.0L LS7 engine generating 505hp backed by a Tremec 6-speed manual transmission. 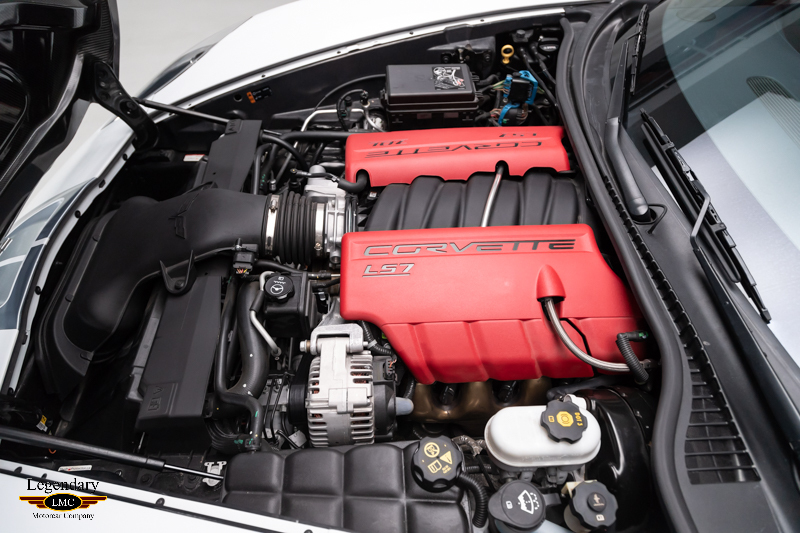 This very clean example has traveled a mere 8,865 miles, due to this it continues to show as new both inside and out, top to bottom. 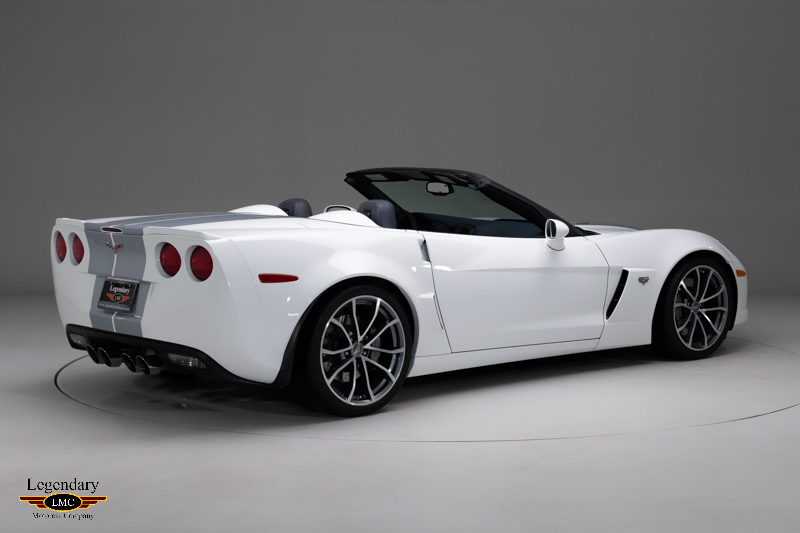 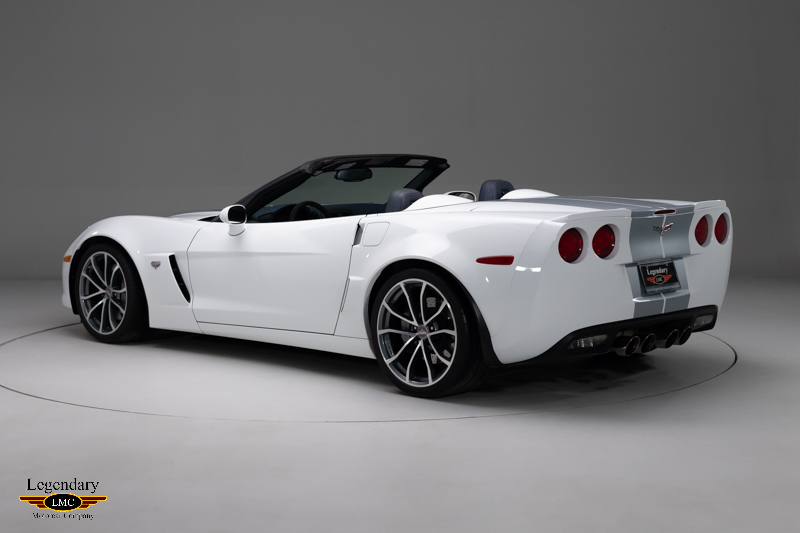 A stunning Anniversary Edition Corvette, perfect for the enthusiast or collectors alike. 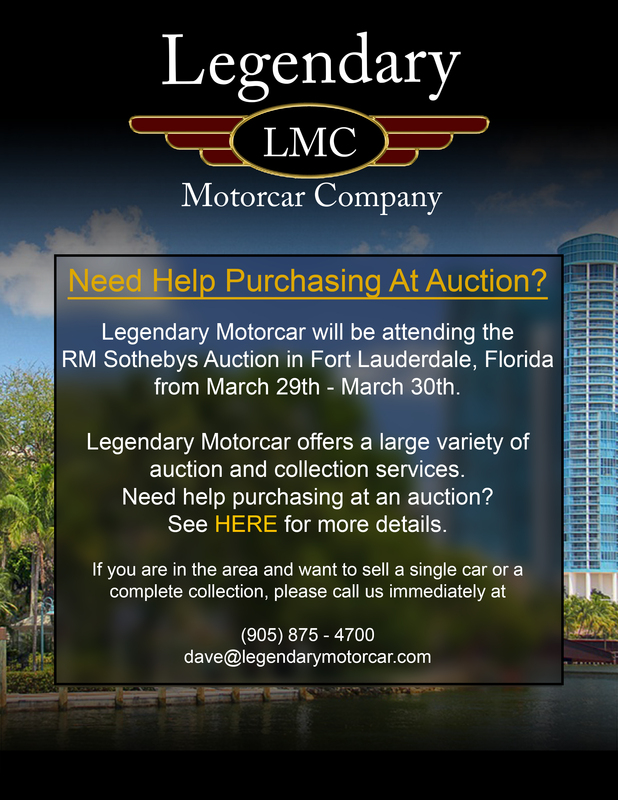 This special 60th anniversary convertible was a limited-edition car making this is a rare opportunity to acquire one with such low mileage. 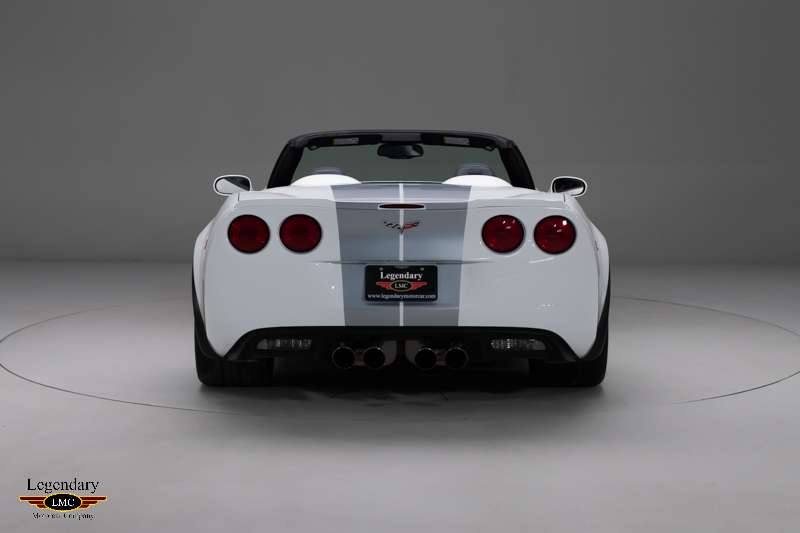 It has always been stored in a climate-controlled environment and used only on special occasion. 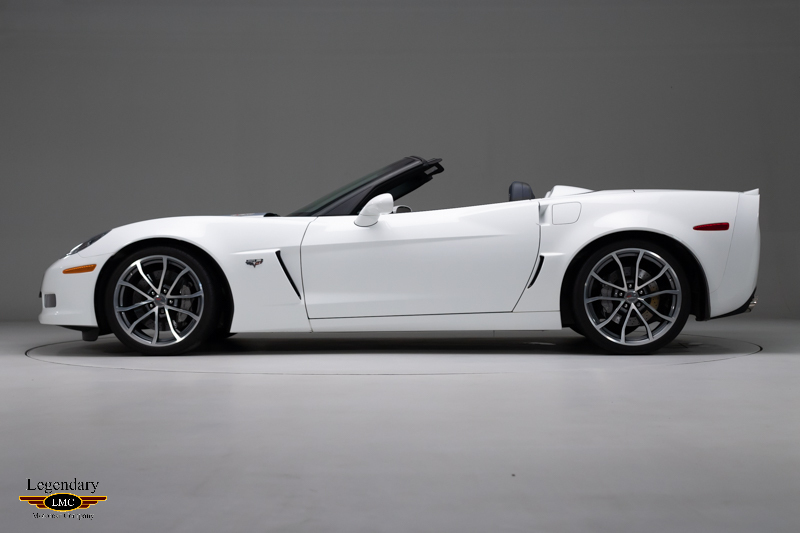 With the racing pedigree, low mileage and limited production run, this 2013 Chevrolet Corvette 60th Anniversary Edition is a collector grade investment. 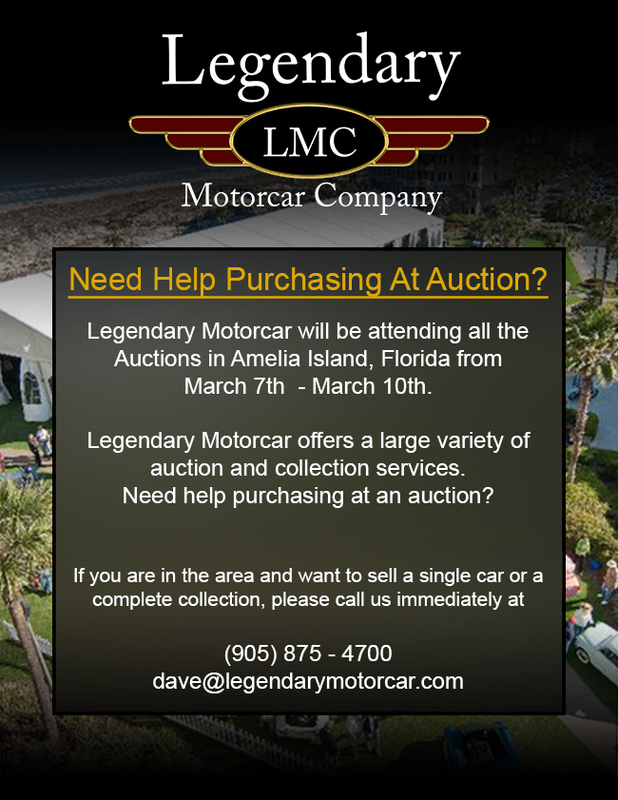 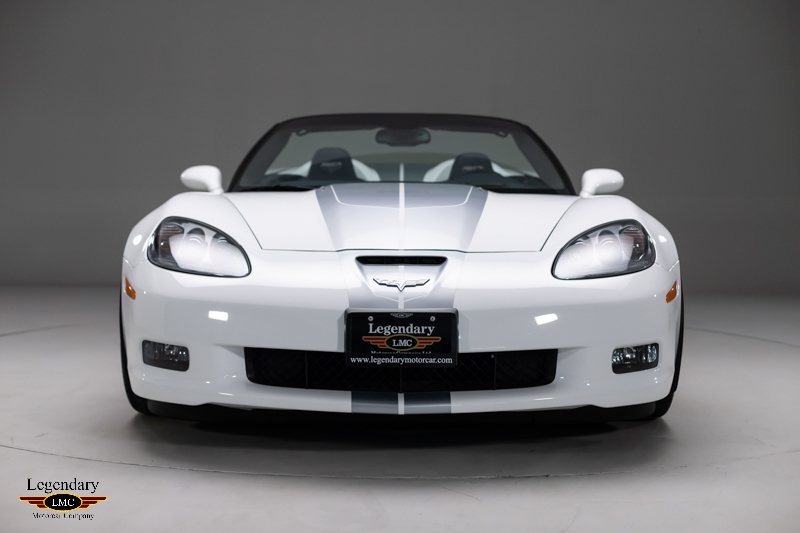 Legendary-Motorcar-Company-Ltd-2019-020 Chevrolet 2013 Chevrolet Corvette 60th Anniversary 2019-020 56900.0000 Legendary Motorcar Company Ltd.